"Magic and magical people--the 'unnatural order' is all around us. There are benevolent witches, malevolent witches, demons, vamps, werewolves, shape shifters, ghosts; it's a protoplasmic party of creature features out there. But unless you know where to look, you won't find them. I know where to look. My name is Harry Strange." And so begins each episode of the Harry Strange Radio Drama. 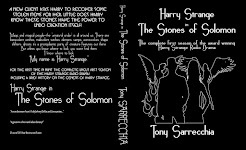 Join us for every whiskey-swilling adventure as Harry applies his own moral code and battles with the Unnatural Order.